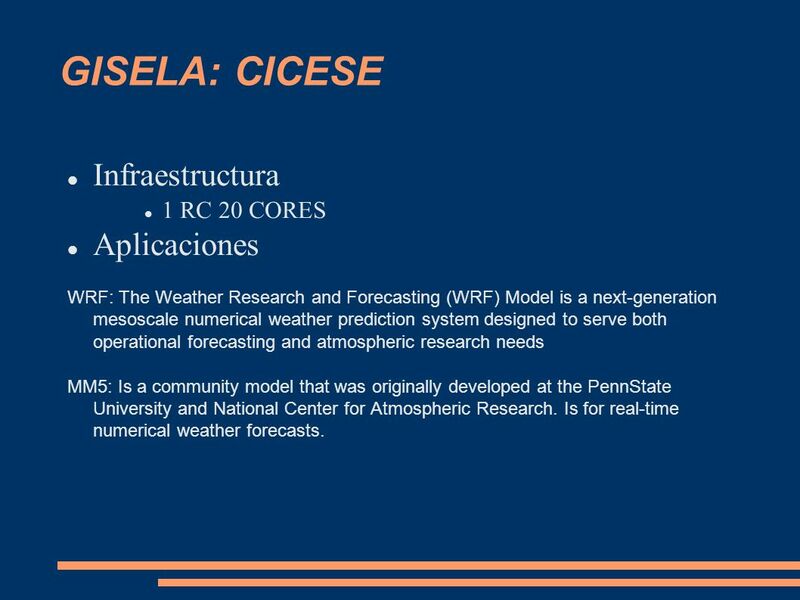 WRF: The Weather Research and Forecasting (WRF) Model is a next-generation mesoscale numerical weather prediction system designed to serve both operational forecasting and atmospheric research needs MM5: Is a community model that was originally developed at the PennState University and National Center for Atmospheric Research. 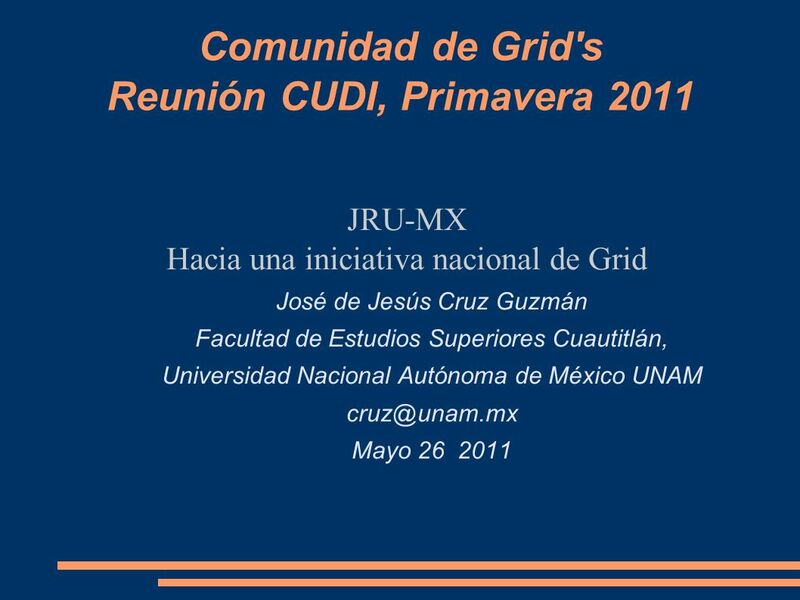 Is for real-time numerical weather forecasts. 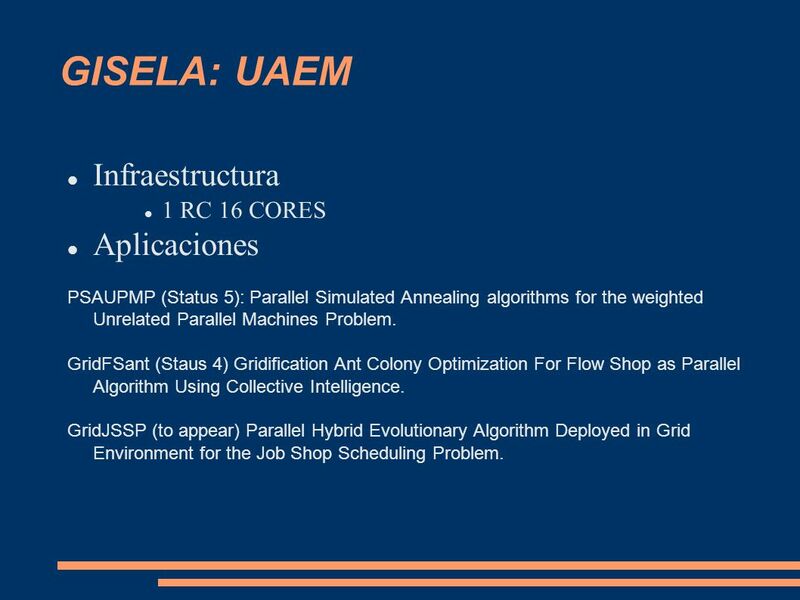 PSAUPMP (Status 5): Parallel Simulated Annealing algorithms for the weighted Unrelated Parallel Machines Problem. 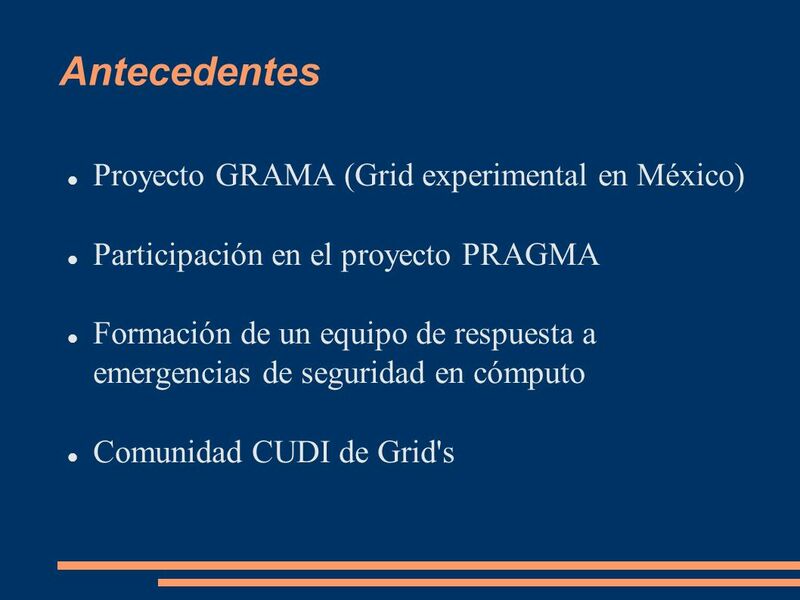 GridFSant (Staus 4) Gridification Ant Colony Optimization For Flow Shop as Parallel Algorithm Using Collective Intelligence. 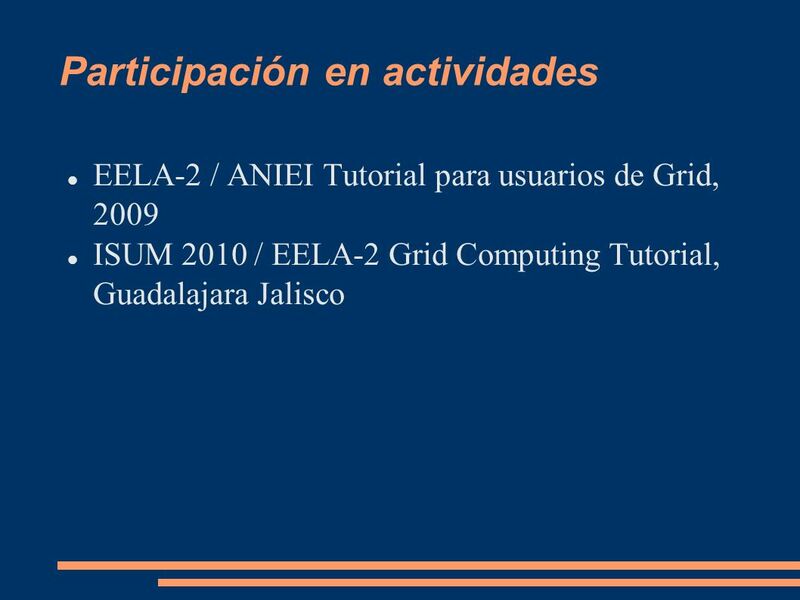 GridJSSP (to appear) Parallel Hybrid Evolutionary Algorithm Deployed in Grid Environment for the Job Shop Scheduling Problem. 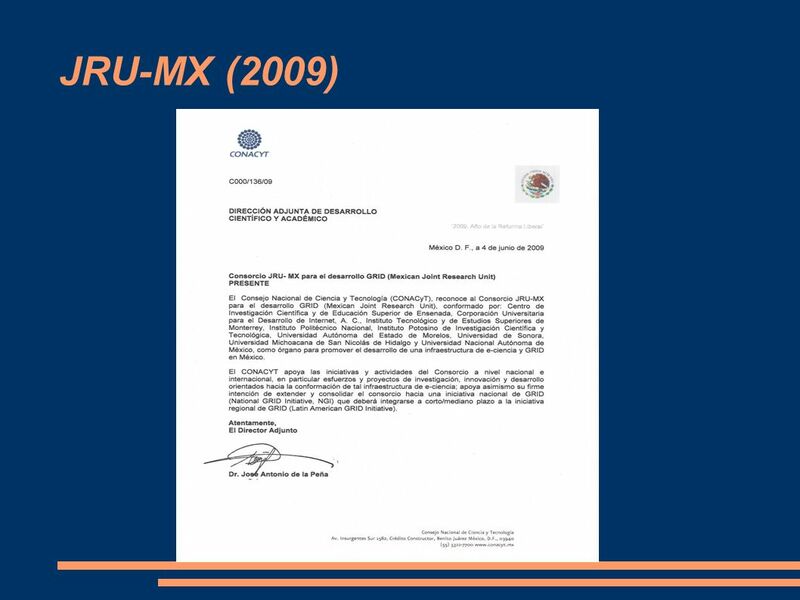 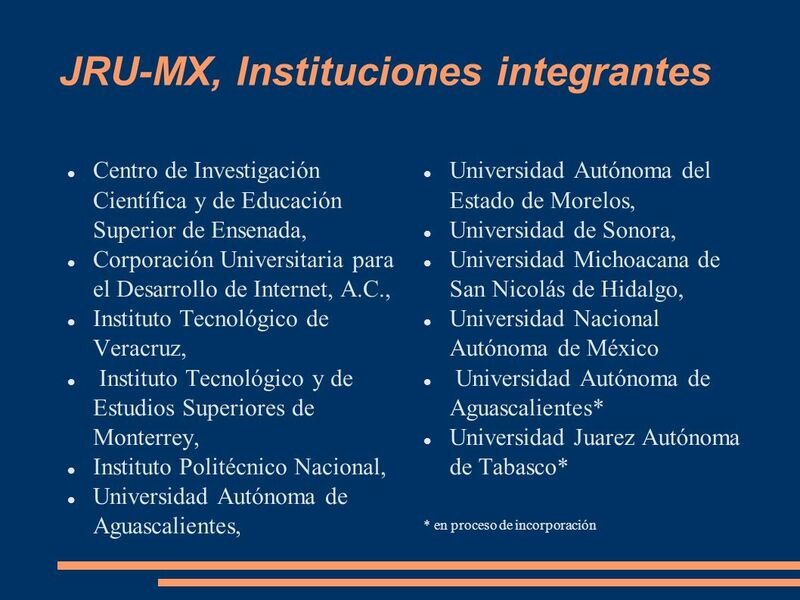 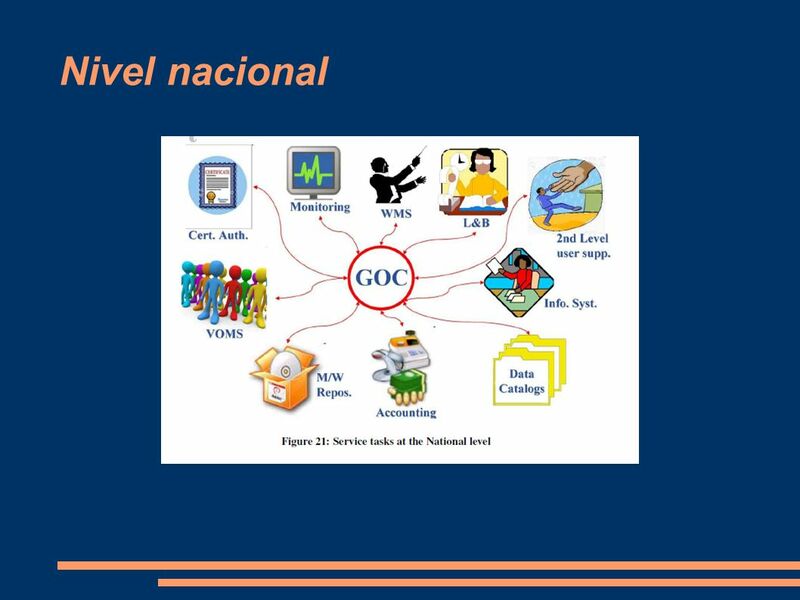 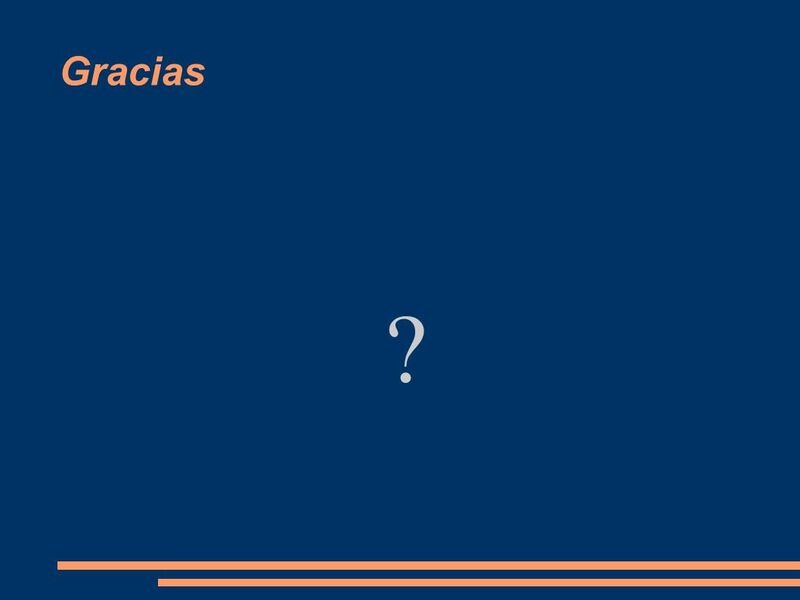 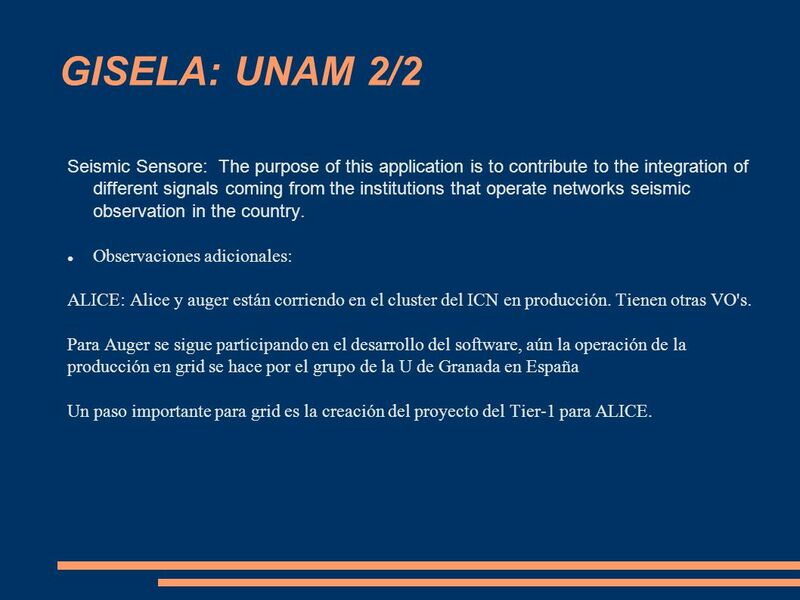 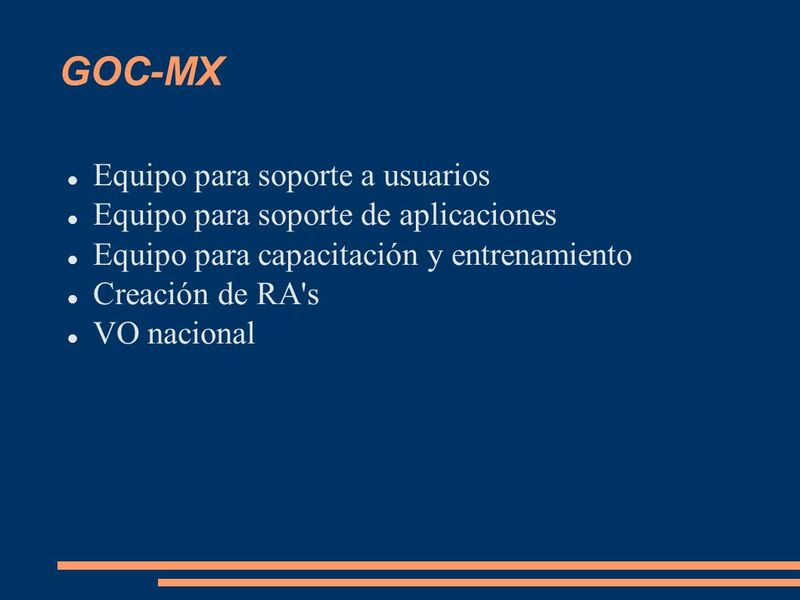 16 GISELA: UNAM 2/2 Seismic Sensore: The purpose of this application is to contribute to the integration of different signals coming from the institutions that operate networks seismic observation in the country. 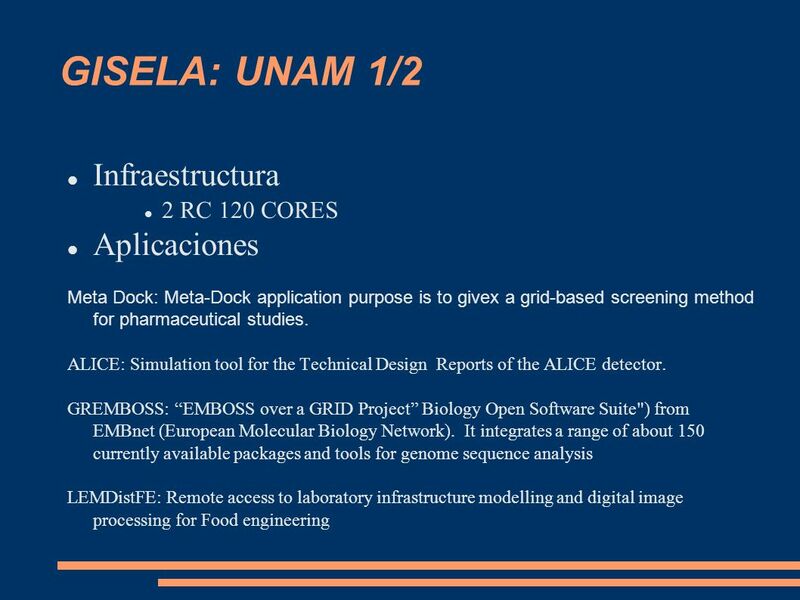 Observaciones adicionales: ALICE: Alice y auger están corriendo en el cluster del ICN en producción. 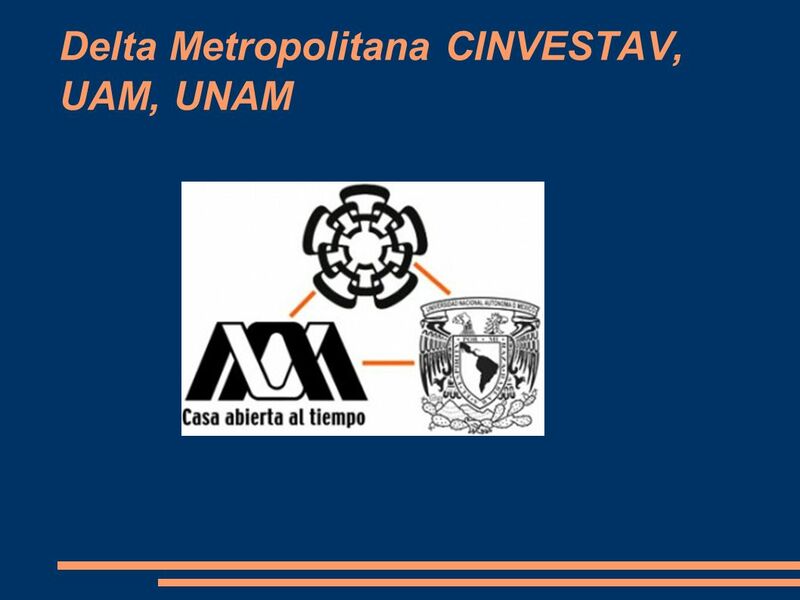 Tienen otras VO's. 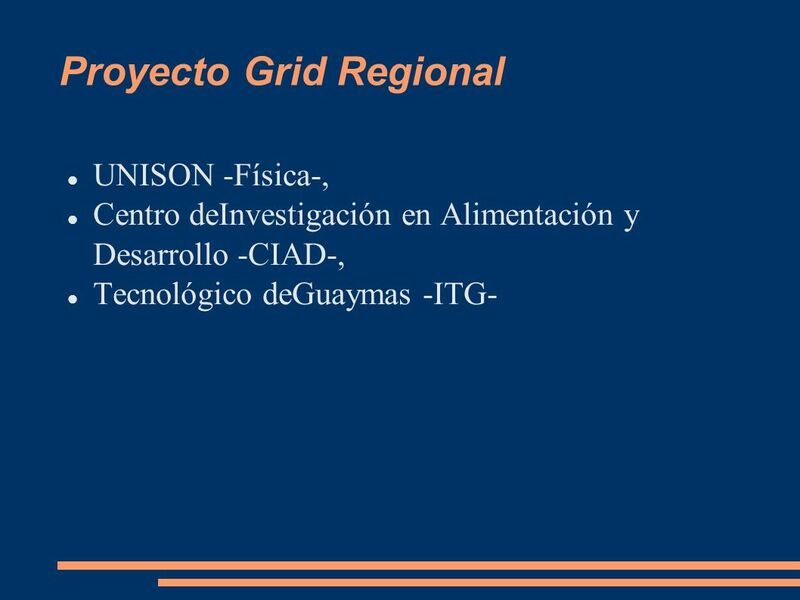 Para Auger se sigue participando en el desarrollo del software, aún la operación de la producción en grid se hace por el grupo de la U de Granada en España Un paso importante para grid es la creación del proyecto del Tier-1 para ALICE. 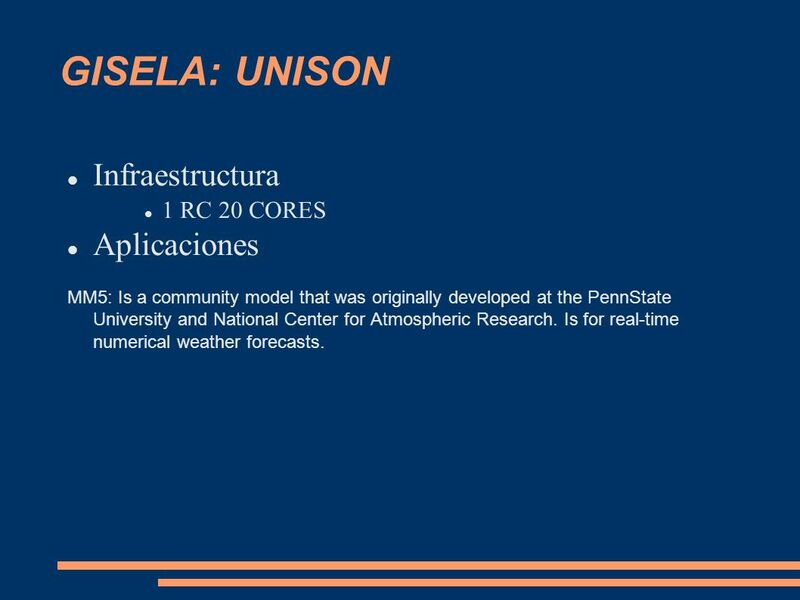 MM5: Is a community model that was originally developed at the PennState University and National Center for Atmospheric Research. 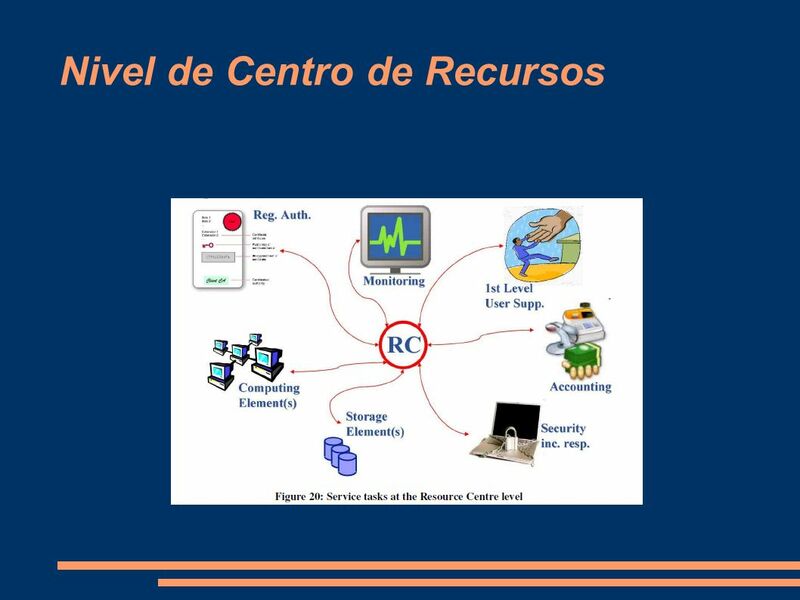 Is for real-time numerical weather forecasts. 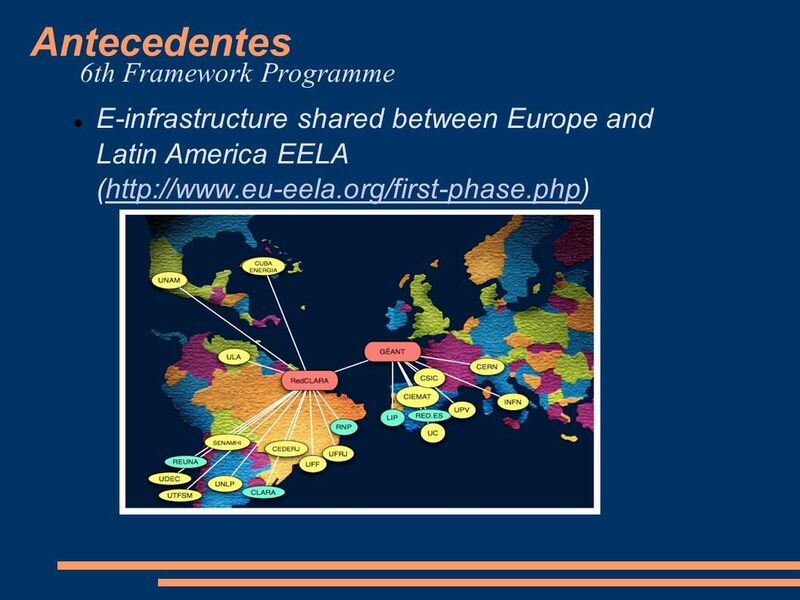 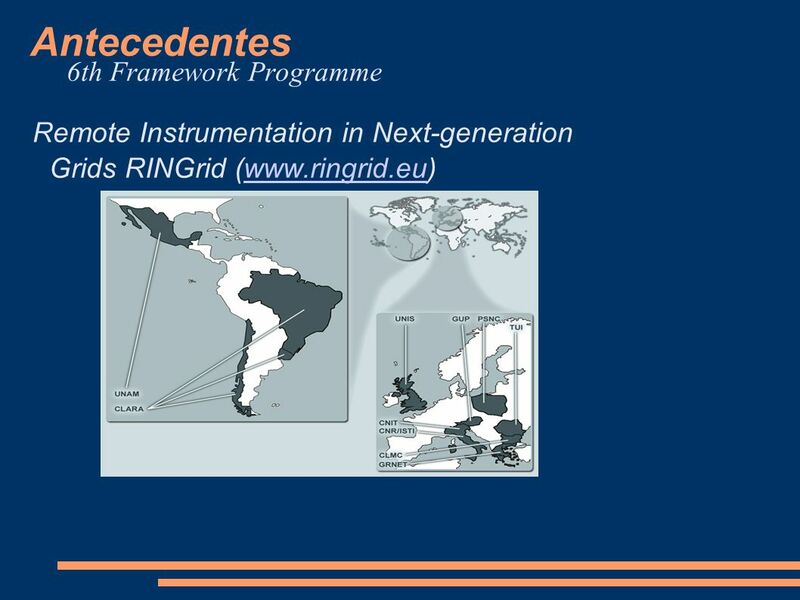 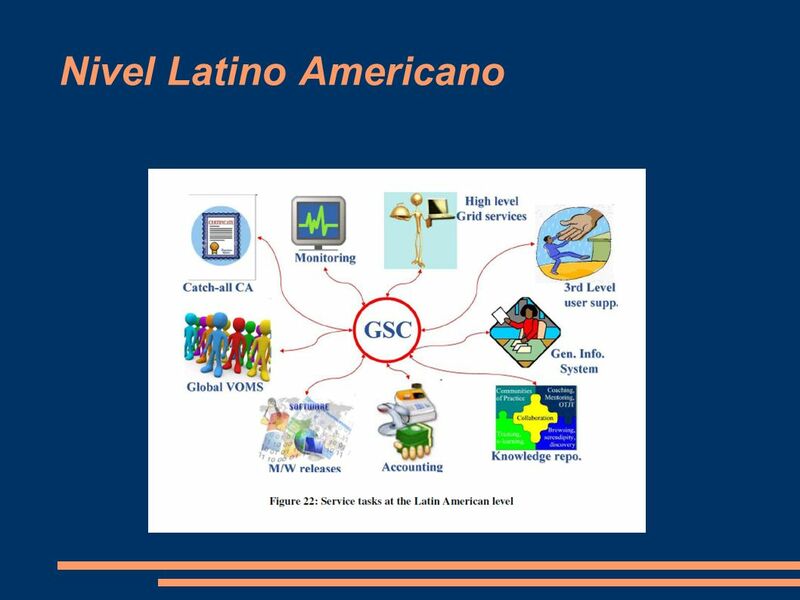 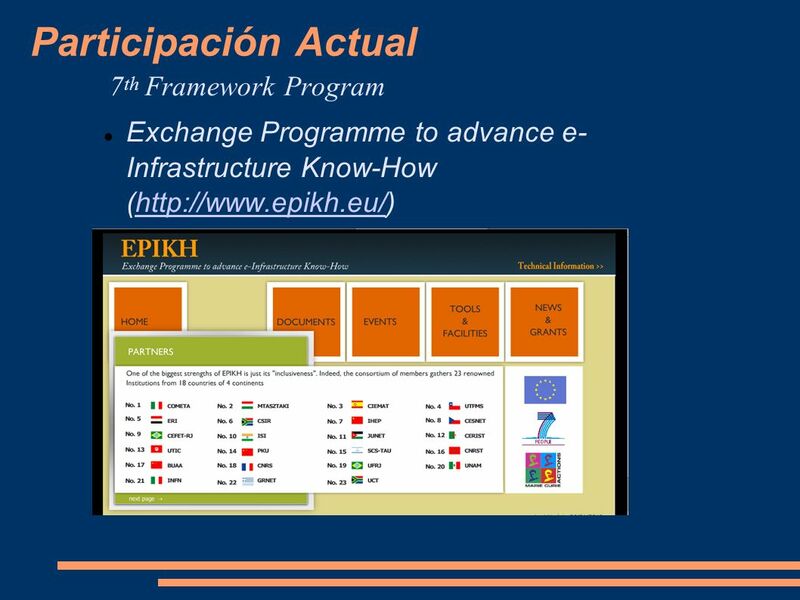 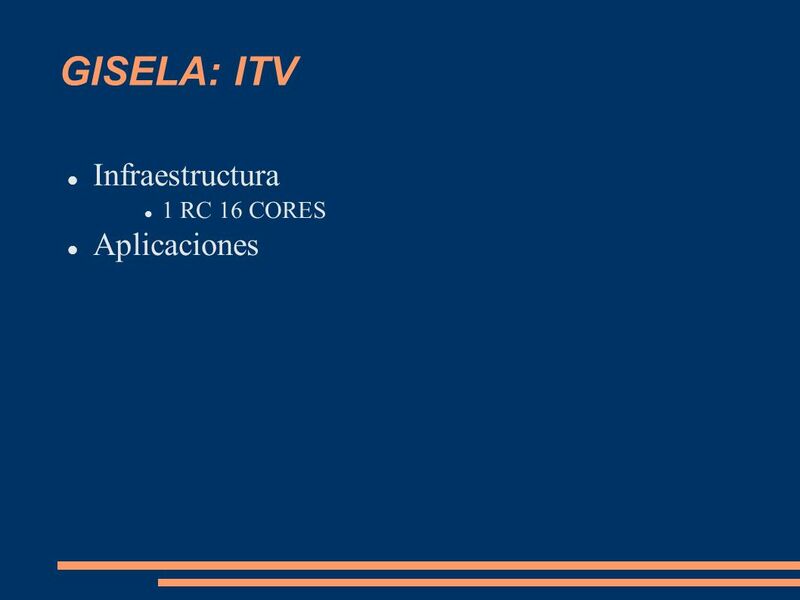 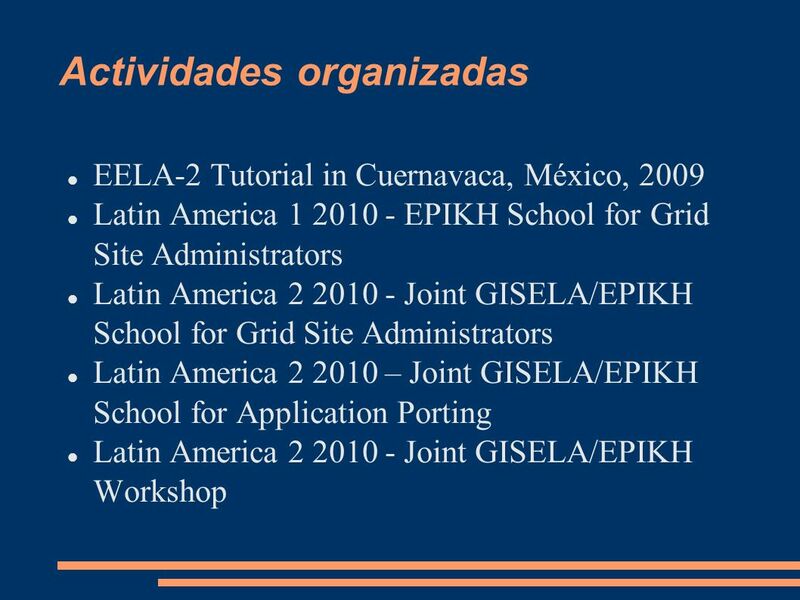 Descargar ppt "Comunidad de Grid's Reunión CUDI, Primavera 2011"
E-infrastructure shared between Europe and Latin America Richard Miguel SENAMHI, Perú 13th EELA Grid Tutorial La Antigua, de Octubre de 2007 Aplicaciones. 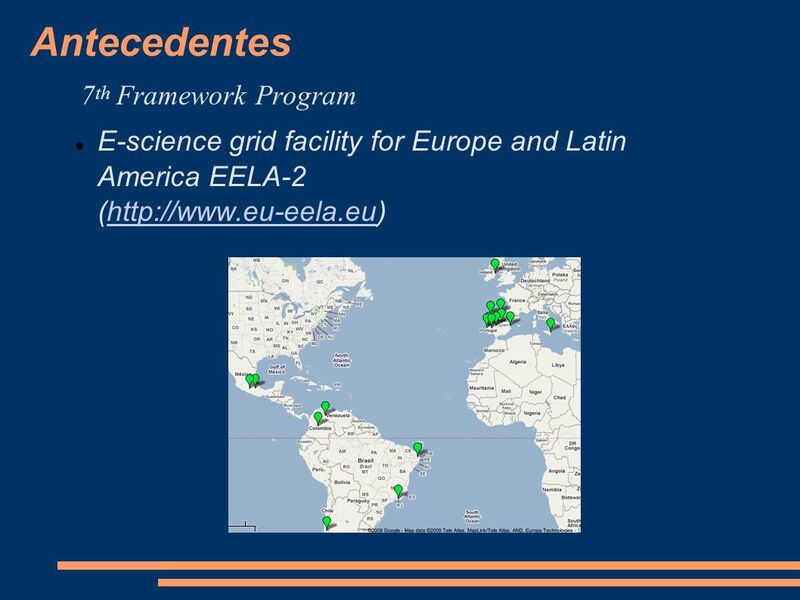 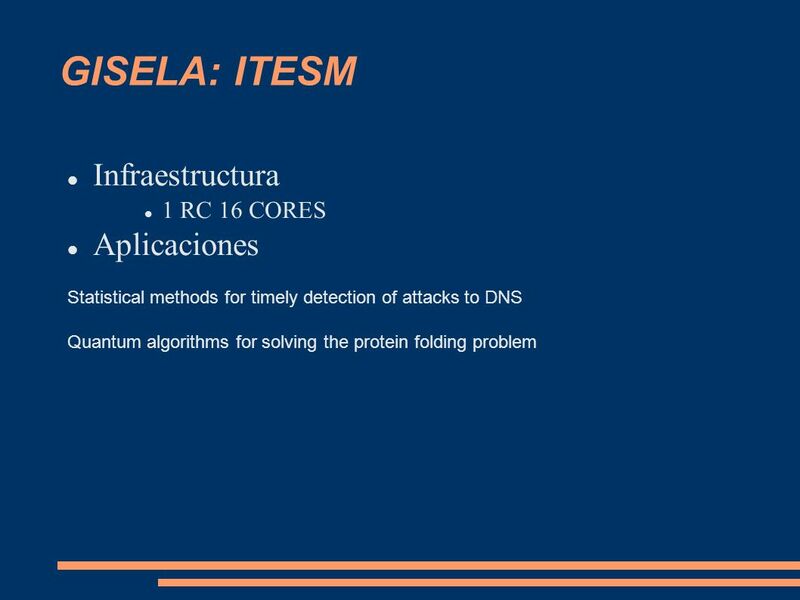 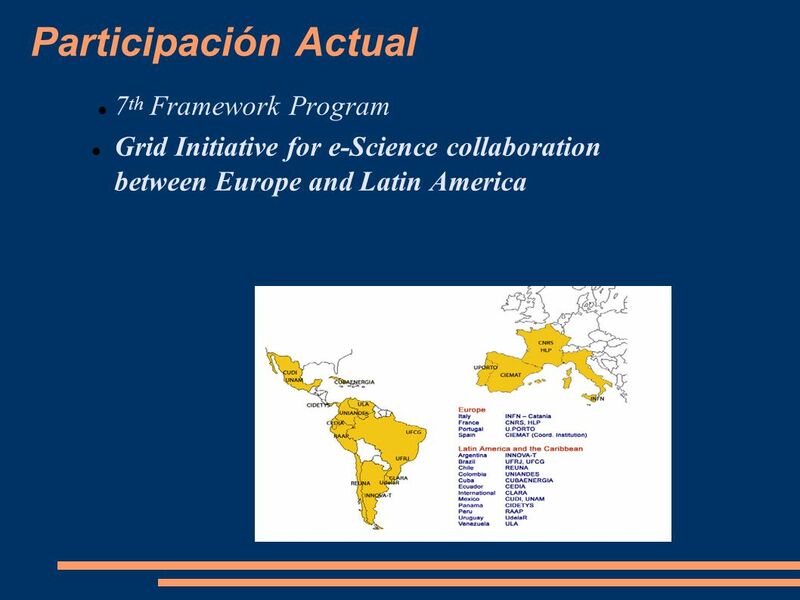 25, 26 y 27 de mayo GISELA: Grid Initiatives for e-Science Virtual Communities in Europe and Latin America: Estado Actual Salma Jalife (CUDI), Luis Trejo.